A sunny May day in the mountains. I mentioned earlier this week that we were hoping to climb up to a nearby mountain to check out one of the last, dwindling patches of snow. The truth is, we’re wimps. When it gets above 70 degrees, which it did this week, we Alaskans overheat, and snow becomes very enticing. And as we discovered, brown bears must share this view. 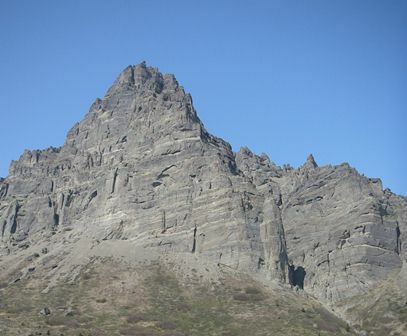 Getting to the base of the mountain begins with an exciting drive down a deeply rutted four-wheel trail that is barely wide enough for one pick-up truck. Alder branches smacked at the side windows, and the truck lurched side to side. Part way down the bumpy trail, we stuck our truck in a mud hole. Even in four-wheel drive, the front tires just spun. While my husband and I lodged rocks and logs under the tires, our daughter bickered in the heat. We contemplated how long it would take to walk to our nearest neighbor’s house and ask for help. Sam and I were skeptical that the ATV and its thin tether would do the job, but sure enough they pulled us right out of the mud. Whew. We planned to park beside the mud hole and go on foot the rest of the way, though it meant we’d never make it all the way to snow. But the friendly people with the ATVs said, “Go for it. If you get stuck again, we’ll pull you out.” Hard to argue with that. We drove to the foot trail without further incidence, waved goodbye to our new friends, and began the hike. We were sweating and hot, and our 4-year-old was whining before we even crested the first hill. But eventually we got into the rhythm of the hike and set our sights on that patch of snow. Cooling toes and paws in a mountain snow patch earlier this week. As we walked, I told my daughters about how often we see bear tracks in the mud along this trail. Sometimes they’re smallish, black bear tracks. But sometimes they are huge brown bear tracks. The 4-year-old picked up her pace, hoping to catch sight of one of these curious animals. My older, wiser daughter began looking nervously over her shoulder. After an hour or so, we climbed up out of the trees and into high alpine country. Lichen and blueberry bushes grew along the rocks, and the fragrance of blooming Labrador Tea filled the air. We were all a bit sunburned by now, and feet were aching and hot. We all kept our eyes to that patch of snow. And then I saw something else. At first glance, I mistook it for a huge stump perched on the rocks. Then it turned its head side to side. “Brown bear,” I called ahead to my husband, who carried the rifle. We all stopped in the trail. I lifted up my youngest daughter, so she could see. The bear was about 300 yards ahead of us, sitting on his haunches, turning his head this way and that. Then he looked down at what I had come to think of as “our” patch of snow. After a minute or so, the bear stood and ambled slowly away from us, down into a valley and out of sight. The old bruin was letting us have the first run at the snow patch. We took off our shoes and socks and squished our bare feet in the snow. 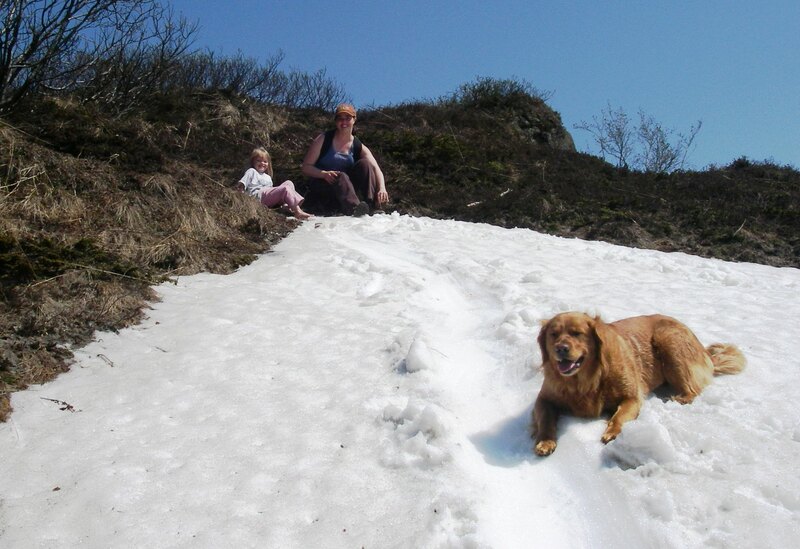 The girls and our golden retriever took turns slipping down the snowy hill. We didn’t see the brown bear again, but I’m certain as soon as we hiked off the mountain, he was out there, sliding his belly across that cool snow. What a great adventure! Knowing Rory, she probably wanted to go play with the bear! What does it mean when you guys are warmer than we are here in North Idaho? I love reading about your Alaska; it brings back great memories. Hi Trista! It’s great to see you on here. And if it makes you feel any better, I think we’re done with summer up here. Cool, rainy — I think it might be snowing in the mountains as we speak. Okay, that is quite enough dispensing derogatory disparaging comments about our current weather. We are not DONE with summer! It is soon to be back in the beautiful 70s and sunshine, I can feel it in my bones, plus I was given inside info from the bees and the beans.